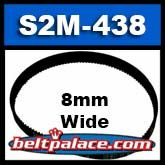 80-S2M-438 STS Supertorque Belt | Synchronous Belt 80-S2M-438 | Contitech/Bando S2M-438 x 8mm W.
80-S2M-438 Supertorque STS 2mm Pitch X 438mm Length X 8mm Width*. 219 Teeth. Replacement “STS Series” industry standard Synchronous Belt. Replacement belt for film projectors and power tools such as CNC Machines, woodworking tools & lathes, pumps, and robotic equipment. ELMO Projector Synchronous Belt 80-S2M-438 - (Select Models). Contitech/Bando S2M-438 x 8mm W Synchronous belt. THIS IS A MADE TO ORDER (MTO) PRODUCT AND NON-RETURNABLE.